OnDemand Licensing fees are a way to incur expenses based only on what you use, no more and no less. This avoids prepurchasing large amounts of excess power that may not be needed for your sites. OnDemand Licensing fees occur in 4 ways. They are explained below with information on how you can control and manage each area to help with reducing OnDemand Licensing fees. How do Bandwidth OnDemand fees occur? Bandwidth OnDemand occurs when your stores are sending and receiving more information within a month than your current account has reserved. OnDemand Licensing is designed so you never pay for more than you need, after you obtain your base package, if you go over the limits set forth you are only charged for the amount used. There are no penalties. Save 50% or more by increasing your account limits by committing to a higher monthly bandwidth amount. 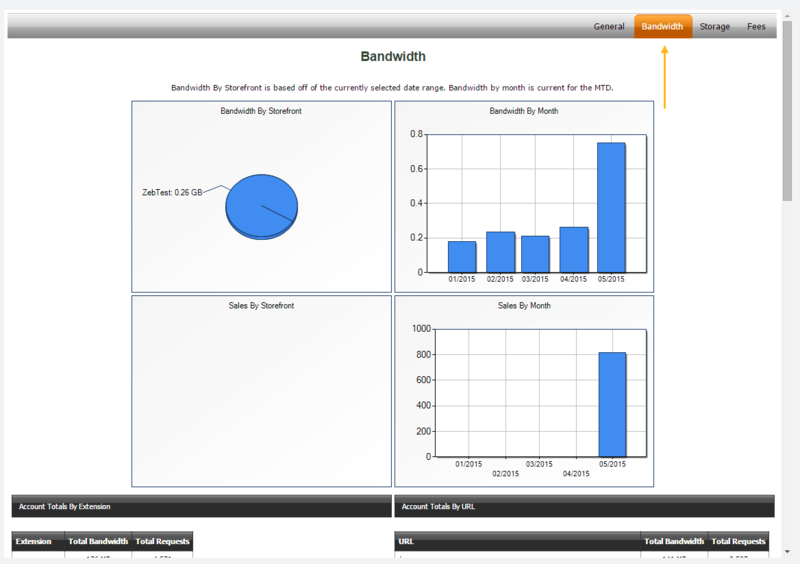 Click on the bandwidth tab and explorer the detailed information provided looking for anomalies and bandwidth spikes. Consider using smaller, more optimized images and optimizing your HTML code for size. However, unless your site is extremely un-optimized (very large images on the home page or template, flash animations, video, etc), making changes here will not reduce bandwidth consumption by much if you have a lot of visitors to your stores. Use FTP for your file/image transfers over uploading single files through the admin console. If you use the Web Service API for routine transactions, consider lowering the polling intervals to reduce bandwidth. An inventory update every 15 minutes versus every hour will use 1/4 the bandwidth, lowering the polling at night hours will reduce it as well. These routine calls can make significant impacts on bandwidth if a lot of data is transferred. 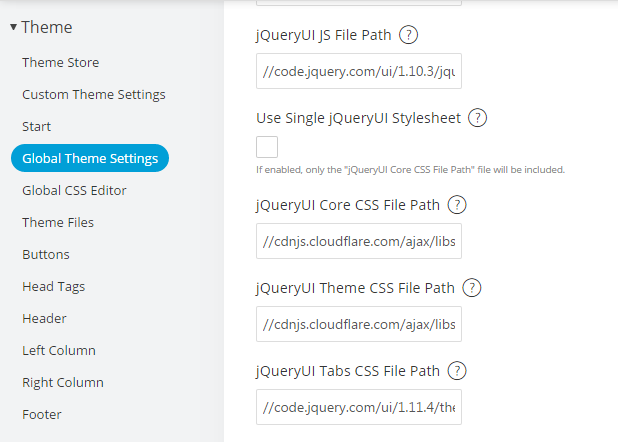 We've added in functionality, to allow you to have Jquery and CSS stylesheets load in from an external server. This will go a long way in reducing the bandwidth of the site. These settings are for the JS, Core CSS, Theme CSS, and Tabs CSS to load individual pieces vs the entire UI styles. 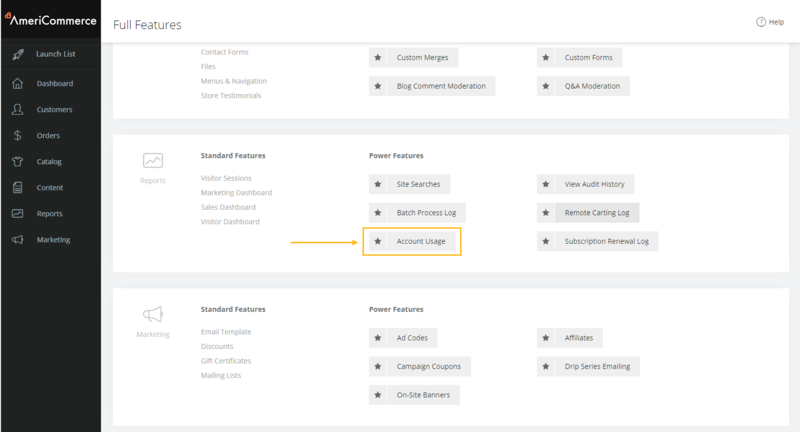 There is also a setting to load a single CSS stylesheet (most CDNs only offer the single combined stylesheet), then only the Core CSS path will be included in the theme. Click the Fees tab from the Account Usage Report to see where the price levels are for different committal amounts. 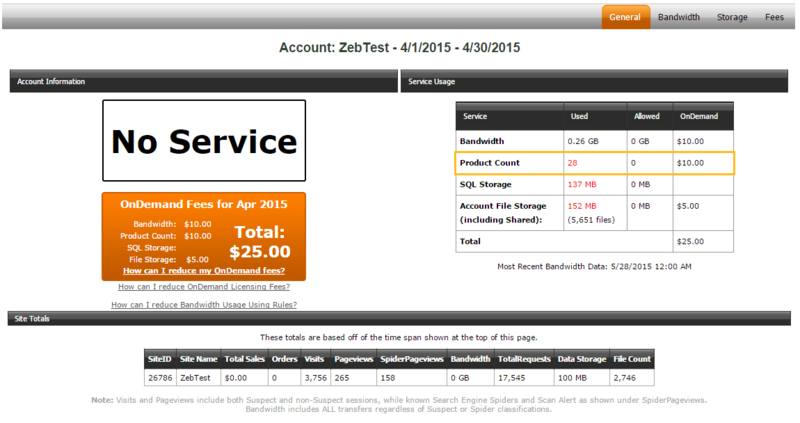 You can save 50% or more on your bandwidth costs by committing to a monthly amount. 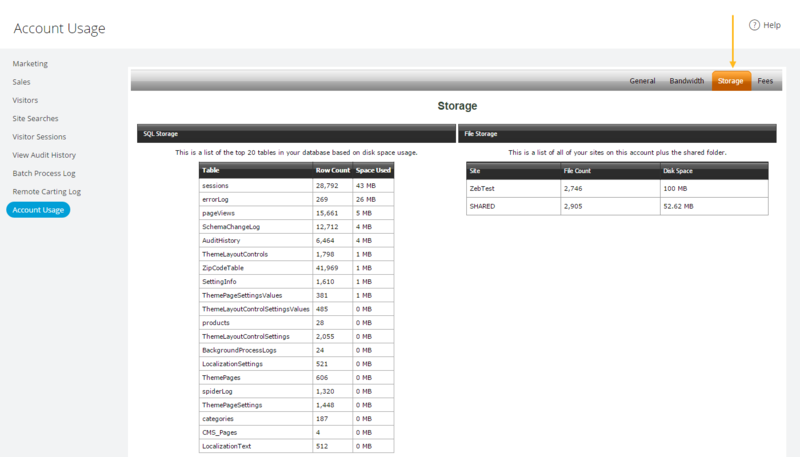 What is SQL Storage and how do OnDemand Fees occur from it? The SQL database stores your product catalog, order history and historical visitor data which is used primariliy for analytics and reporting. 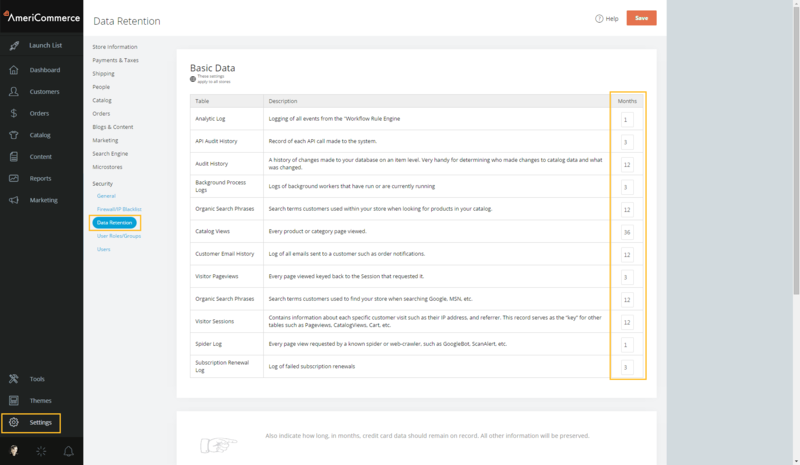 The catalog and other tables do not typically take up a significant portion of your database. You can see the space used in each table by viewing the account usage report. SQL Storage OnDemand fees typically occur when a large amount of visitor data is collected and stored over a period of months or years. All of the visitor information is logged and stored. Over a period of time, historical data can grow quite large thus using up SQL Storage. The most common tables that take up the overwhelming proportion of SQL space are the Sessions, PageViews, CatalogViews, SpiderLog and a few others. This information is primarily for reporting purposes and for most store owners it is highly unnecessary to pay for the extra fees incurred on this data being stored beyond 2-3 months. Navigate to Settings>Security>Data Retention. You will need to indicate the amount of months you would like to keep each block of data and click save after making your changes. Data file storage is in most cases product photography, videos, site graphics, static HTML pages, catalog import / export files, etc. This does include directories for the 'Theme' of your store, and the image cache when using dynamically generated thumbnail imagery. Delete any un-used product photos and old import / export files to save space. Clear the image cache to remove old images that may not be needed any longer...each time you change a product image size on your theme it will make new images matching that size. Products are counted based on individual product records in the Catalog database, both for hidden and visible products. Unlike some shopping carts, Variants and Attributes do NOT count as duplicate products. Only the base product is counted towards this limit. See the current product count for your store on the Account Usage report. Does the built-in tool have the ability to delete multiple files? If so, I can't figure it out. I could delete the entire cache directory. If I do, will it be automatically recreated? Thanks.